Seattle's first taste of Major League Baseball wasn't very palatable. The Seattle Pilots were one of four expansion teams in 1969 and played at a renovated minor league park called Sicks Stadium. The Pilots crashed, losing 98 games and finishing last. After one season, the Pilots bid Seattle adieu and headed for Milwaukee. Seattle turned its attention from the skies to the seas, where eight years later the Mariners sailed into Seattle and weighed anchor at the Kingdome, the first indoor ballpark in the American League. The Mariners first game was a 7-0 whitewashing at the hands of the California Angels on April 6, 1977 and it was a portent of things to come for more than the next decade. Seattle would finish last, or next to last, in 10 of its first 13 seasons and not post a winning record until 1991. During these lean years the Mariners had little to offer, and what excitement they generated came from veteran players finishing out their careers in the great northwest. Willie Horton hit his 300th career home run for Seattle in 1979 and 43-year-old Gaylord Perry (known as the "Ancient Mariner" for obvious reasons) won his 300th game against the New York Yankees on May 6, 1982. The Mariners fortunes began to turn in 1988 when they brought Edgar Martinez to the varsity squad and obtained promising slugger Jay Buhner from the Yankees. The next season they unveiled an effervescent young center fielder named Ken Griffey Jr. and traded for lanky lefty Randy Johnson, who would post a 133-74 record for Seattle during the next 10 seasons. Under second-year manager Jim Lefebrve, the Mariners posted an 83-79 record in 1991, although they finished 12 games off the pace. This wasn't good enough for Mariners' owner George Argyros, who fired Lefebvre and turned the team over to its 10th manager in 10 years, Bill Plummer. But 1992 was a last-place disaster of a season and led to the hiring of Lou Piniella. The Mariners lynchpin season was 1995. Lagging attendance and a growing displeasure with the Kingdome generated talk of the team going the way of the Pilots and heading for greener pastures. On the field, the team was 13 games behind first-place California in August. Led by Johnson (18-2, 2.48), Buhner (40 home runs, 121 runs-batted-in, .262 average), and the Martinez boys, Tino (31 homers, 111 RBIs, .293 average) and Edgar (29 homers, 113 RBIs, .356 average to lead the American League), they went on a tear and caught the Angels on the last day of the season. Seattle won the one game playoff to clinch its first Western Division crown. It fell behind by two games in the best-of-five division series to the Yankees, only to come back and sweep the last three. It won the decisive fifth game in the bottom of the 10th, rallying from a one-run deficit to win on a two-bagger by Edgar Martinez that came to be known in Mariner Land simply as "the double." Although they fell to the Indians in the American League Championship Series, the Mariners' late season heroics generated big crowds, lots of enthusiasm and popular support for a new ballpark that would manifest itself in Safeco Field in 1999. As if they didn't have enough hitting, the Mariners introduced Alex Rodriguez in late 1995 and the young shortstop burst on the scene in 1996 (36 homers, 123 RBIs, .358 average) as part of a lumberjack lineup that would hit 245 home runs. Griffey (49 homers, 140 RBIs, .303), Buhner (44 homers, 138 RBIs, .271) and Edgar Martinez (26 home runs, 103RBIs, .327) led the onslaught. Despite the power, the team finished second, unable to overcome an injury to pitching ace Johnson. Johnson was back with a flourish in 1997, recording his only 20 win campaign for Seattle. It won the Western Division, this time smashing 264 home runs. All nine regulars had double-digit home run totals led by Griffey (56), Buhner (40), Paul Sorrento (31), Edgar Martinez (28) and Rodriguez (23). Their slugging prowess could not save them from a first-round playoff defeat to Baltimore. The Mariners then endured consecutive losing seasons in 1998-99, with the team moving to Safeco during the latter season. Johnson and Griffey were traded, but the Mariners were invigorated with a new infusion of talent. Freddie Garcia (17-8 in 1999) and veteran Jamie Moyer replaced Johnson on the pitching staff, and in 2000 newcomer Kazuhiro Sasaki anchored the bullpen with 37 saves. The Mariners won the 2000 Wild Card and beat the White Sox in the first round, only to lose to the Yankees in the American League Championship Series. The Yanks and Mariners would rematch in the 2001 American League Championship Series under very different circumstances. The Yankees were three-time defending world champions and New York City was coming off the terrorist attacks of September 11. The Mariners entered the series having set a modern day measuring stick for team success. They won an American League record 116 games behind Ichiro Suzuki, who made a spectacular debut in American baseball, winning the Rookie of the Year Award, Most Valuable Player Award and a Gold Glove. He hit .350, had 242 hits and stole 56 bases. Bret Boone (37 homers, 141 RBIs, .331) had his best season, with Edgar Martinez (116) and Mike Cameron (110) topping 100 runs-batted-in. The Yankees put a damper on Seattle's storybook season with a five game win in what was a much anticipated, but somewhat anticlimactic series. Seattle has not returned to the postseason since that defeat. It has produced some of baseball's greatest individual players of the last decade, including Suzuki, who broke the record for most consecutive 200-hit seasons with nine in 2009. However, it has yet to achieve the ultimate of making it to, or winning, a World Series. Charlie Furbush 0.2 " "
Stephen Pryor 0.1 " "
Lucas Luetge 0.1 " "
Brandon League 0.2 " "
Tom Wilhelmsen 1.0 " "
Did you know that on March 31, 1998 , the Seattle Mariners set a team record for largest attendance during an Opening Day game when 57,822 fans watched them lose to the Cleveland Indians 9-10? 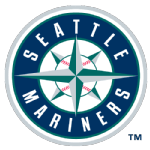 On April 29, 1999 , the Seattle Mariners set a team record for runs scored during an inning with eleven in the fifth inning versus the Detroit Tigers . The Seattle Mariners set a team record for hits during a game on September 3, 1981 , with twenty-four versus the Boston Red Sox . On June 11, 1996 , versus the Minnesota Twins , & on September 22, 2004 , versus the Anaheim Angels , they tied their own record.